Die „urban swimming conference 0.1“ ist konzipiert von pool is cool [pooliscool.org], eine offene Plattform von Bürgern und Experten, die sich um die Wiedereinführung von Freibädern in Brüssel bemüht, zusammen mit der Agentur für Kunstvermittlung agency art education [www.agencyart.education], public school for architecture [http://www.psfa-bxl.org], eine alternative Bildungsplattform die autodidaktische Bildung zu Architektur unterstützt, und Baya Eden Kassel [baya-eden.net], besser bekannt als das Parkhaushotel der documenta13. At public open air swimming places people of different cultures, genders and ages can meet, and sometimes also confront each other. As such, although the concept of a public outdoor swimming place is simple at first sight, they are actually multi-layered and complex public infrastructures. They have a strong impact on a city’s overall quality of life, even influencing the perception and role of certain areas in cities. Urban swimming can be linked to the development of cities, its society and cultural life. The INTERNATIONAL URBAN SWIMMING PRE-CONFERENCE is based on the shared experience that conferences which focus on specific cities eventually deal with recurrent topics. It’s an attempt to define these universal questions and approaches that different cities, initiatives and projects have in common as a preparation for a subsequent International Urban Swimming Conference in 2018. 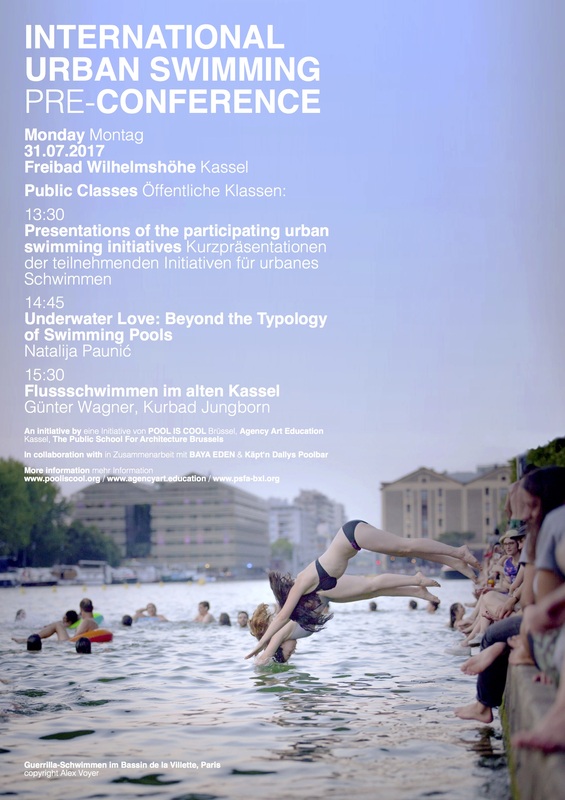 The INTERNATIONAL URBAN SWIMMING PRE-CONFERENCE is initiated by POOL IS COOL Brussels, Agency Art Education Kassel and The Public School for Architecture Brussels, in collaboration with Baya Eden and Käpt’n Dallys Poolbar.